For product name, use IOSAttachmentBehaviourTutorial and then fill out the Organization Name and Organization Identifier with your customary values. Enter Swift as Language and choose Next. Go to the Storyboard and drag a View from the Object Library to the main View. Change the background color to black in the Attribute Inspector. Go to the size inspector and change the width and height to 25. Add another View and change the background color to blue. Also go to the size inspector and change the width and height to 100. The small, black view will be the anchor where the blue view will be attached to. 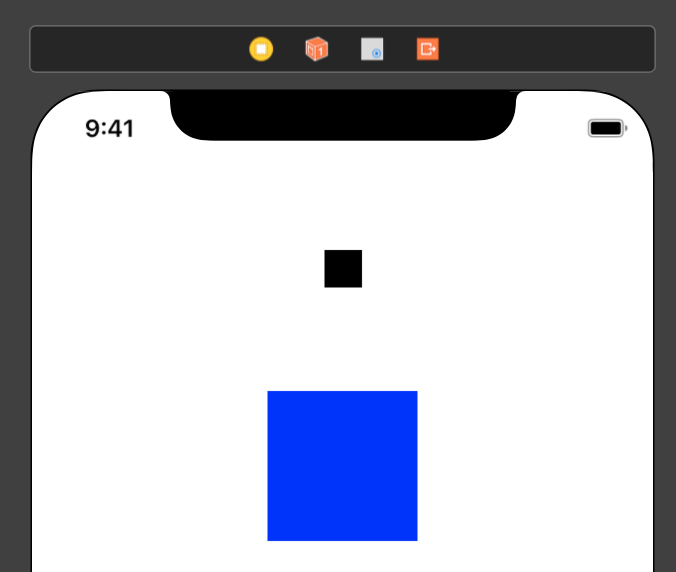 Next, add a Tap Gesture Recognizer to the main View. The Storyboard will look like this. Select the Assistant Editor and make sure the ViewController.swift is visible. Ctrl and drag from the small black View to the ViewController class and create the following Outlet. Ctrl and drag from the blue View to the ViewController class and create the following Outlet. Ctrl and drag from the Tap Gesture Recognizer and create the following Action. Make sure the Type is changed from Any to UITapGestureRecognizer. Go to the ViewController.swift file and create the following properties. The anchorPoint and the center location of the smallView are updated to the location of the tap. Build and Run the project, Tap in the main view to update the anchor point. You can download the source code of the IOSAttachmentBehaviourTutorial at the ioscreator repository on Github.